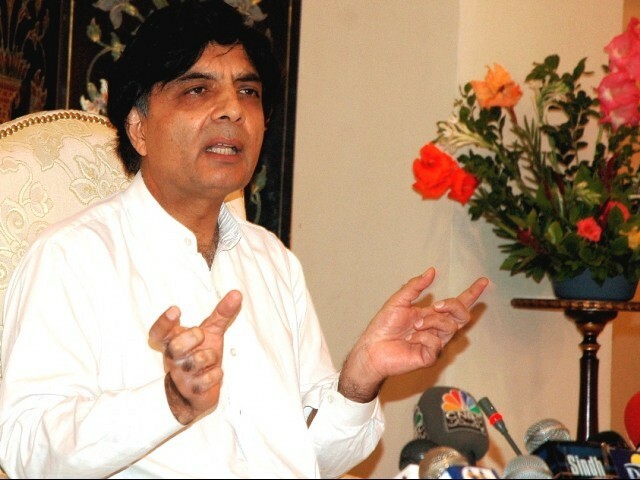 Imran Khan has earned millio­ns and not paid taxes for 20 years, says Nisar. ISLAMABAD: Opposition leader in the National Assembly Chaudhry Nisar Ali Khan said on Sunday that the assets declared by Pakistan Tehreek-e-Insaf (PTI) chairman Imran Khan were “not enough”. Pointing out the flaws in Khan’s assets declaration, Nisar said that the PTI Chairman had mentioned why he didn’t pay taxes but failed to reveal all his sources of income. Replying to Khan’s claim that the money he received through the World Cup was tax-free “according to a law that was drafted by Nawaz Sharif,” Nisar explained that taxes have to be paid to the country where the income was generated. Nisar said that Khan had only revealed that the land he possesses is worth “around Rs145,000/kanal,” however he did not mention the total cost of the 300 kanal land he owns. The opposition leader said that Khan has always said, on several occasions, that he had brought this piece of land with money he received after selling off a flat abroad. But, Nisar pointed out, Khan’s documents stated that someone gifted him the plot. Nisar was responding to Khan’s declaration of assets during a press conference in Islamabad earlier in the day, where the PTI Chairman challenged all political party leaders to do the same. The opposition leader said that both Nawaz and Shahbaz Sharif have paid many lakhs in taxes through their business ventures. Continuing his critique, the PML-N leader said that Khan’s politics revolved around accusing people of various crimes via the media. He said “media trials” hold little value over presenting or registering a case in court. Clarifying the PML-N’s position on corruption, Nisar said the party had proposed a bill demanding the formation of a tribunal to investigate assets of various politicians, but not one political party was prepared to support the bill. Nisar also questioned how Khan could bring about a revolution with the “Musharraf league’s trash”. PTI chief to address PML-N’s allegations; make party announcements. Accountability is ‘impossible’ under the current govt, says the leader of the opposition. PML-N holds counter press conference, defends foreign remittances law. As I said earlier He has started talking trash. Way to go! PML PPP MQM ANP should stop talking and show some action by declaring assets. These parties have blundered billions in dollars when ecver they were in power. Imran Khan never held a public office and yet was first one to declare. No one can challenge IMRAN KHAN 2 achievements WORLD CUP 1992 and CANCER HOSPITAL. God bless Imran Khan and PTI. Choudhry sahib. Imran Khan is running a full fledge Charity hospital, treating millions of people free of charge. What have you got to show for yourself? The blame game of Pakistani politicians will go on until the last day of the world. I am sick and tired of these politicians who are equally responsible for breaking Pakistan and making Bangladesh in 1971. Why doesnt Imran khan speaks against MQM JUI PPP ? Nisar sahab you must show your asserts before the media, it will prove the reality. Shame on you nisar, your kids are American citizens and you sit in Pakistan and play your dirty politics on the only patriotic leader of this country. We have rejected you and your fake degree party. Peace. Continuing his critique, the PML-N leader said that Khan’s politics revolved around accusing people of various crimes via the media. He said “media trials” hold little value over presenting or registering a case in court. Blockquote Definitely the courts are always on your side, since the Asghar Khan case is still pending after 20 years…..so you can easily play court court with anyone!!! Chaudry Nisar himself holds an American passport. So does his wife and children (according to wiki leaks). And yet for politics sake he criticises America, even when his own wife and children are American? Come on Nisar. You said Captain house is worth billions, according to experts it has gold bricks right. They can’t show their assets, If they do so will be proven tax evaders. Spending money on charity is not a valid reason to evade tax. by the way if charity is standard, I prefer Eidhi. Imran Khan has done something unique. Others should follow suit and then talk and blame. Sharif brothers should show some guts and not use a proxy. A leader has to be transparent and that is what Imran Khan is! He is the second Jinnah in making and a God gift to Pakistan. The juggernaut is unstoppable. Long Live Imran Khan. PML-N shooting themselves in the foot! They have taken Khan’s bait – yeah! if imran khan is right about his allegation, why doesn’t he go to court? really he was one of the guy fighting for supreme court and chief justice. surely he believe in independence of court. also would like to know the source of money spent on lahore jalsa? Is it the sound of fear…Mr. Nisar? so you hold a press conference on imran khan’s assets? what about holding one to declare your own? It is highly regrettable that political leaders have chosen wrong targets and wasting their ammunition instead of targetting the right person who is master and source of all corruption. A president with increasing domestic pressure caused by corruptioon and lack of good governance and now the memogate saga, has increasingly and successfully manouvred to channel peoples anger on memogate towards inner elements and outer characters – imagined and real. Listen Imdran Khan and Nawaz Sharif and all other opposition leaders: keep your political differences aside, and concentrate on the memogate where the president has seemingly committed an act of treason by inviting a foreign army to interfere and act against pakistan’s armed forces. While sitting with Lotas and faces of corrupt political system, he is talking Inqalab. It is another pml in making, only difference is the name, now it is called pti. Look who is talking? Ch Nisar? talking of what: Imran Khan’s assets? and what about his own assets? Can Nisar hold a press conference to tell how much money he has? how has he made his properties over the last 20 years? where the money came from? Nisar should not insult the intelligence of common Pakistanis, he and Mian Nawaz and Shahbaz all need to come forward and declare their real assets and tax return and give copies to the media so that people can check; it’s time to take wigs off and talk sense..
& imran Khan’s Kids are NOT british national ? They live 24/7 in Pakistan ? come up with some better arguments! that is unlikely. a lot can come out in court. perhaps much more than the Sharif family would want. A case of sour grapes Chaudhry Nisar. Instead of maligning Imran Khan why don’t you declare your assets? And more importantly those of Nawaz and Shahbaz?! Only MQM is the party that has no corruption charges, rests are mudslinging each other to prove each other dirty. Sorry Nisar this time around your propaganda won’t fly…This time around we want to give Imran a chance. You now have a chance to clean your act, abandon your US citizenship and come clean to us next time around for votes and we will think then…For now it is IMRAN KHAN NATION!!!! sick and tired of this man’s crap. I am tired of these PML N and PPP buffons playing a blame game. Chaudry sahab, your party was in power twice why didn’t you make it mandatory to declare assets then if you are worried about corruption. These people are all talk and no action. They think mudslinging like the yester-years will shut PTI up but they are sadly mistaken. The awam demands accountability of these public servants. Chaurdry sahab, you are supposed to serve “us”, the people of Pakistan ; not rule over us like tyrant !!! Yea right what about babar ghori and his shipping deals??? For whatever its worth,even if Imran khan fails he must be given a chance to prove himself. PTI Zindabad! I am sick and tired of Paksitani politiicans and politics in Paksitan. It is nothing but a fraud with innocnet people of Paksitan who are fooled for last 64 years and crushed under misreable living coditions. for the sake of change let us divert our attention to preety and innocnet Veena Malik and get some rosy pictures to brighten our otherwise dead life. Instead blaming Imran, Please public the assets of Sharif Family and let the people know what PML-N leader has with him and Family. I bet that Sharif Family will never let people know and will try its best to avoid public knowledge of their assets. Imran kai pas to 02-3 ploits thai aur kia but Sharif Family has plenty of industries and lands. I am not against the propoerty but the problem is the transaction for the business in Saudia and UK whcih transaction is doubtful. Why PML-N is avoiding the declaration of assets in public,. no such intetiontion shown by Sh Nisar. I bet that they will never as they do not want the people know their assets. It will politically hurt them when people know that how wealthy they are and also the transaction to setup factories in Saudia and UK is also doubtful. DOnt criticize Imran, tell us your assets. PML N has no other option but to put false allegations on Mr. Khan for their survival. I expect alot more mudslinging on Mr. Khan by PML N in near future but I also believe that it would backfire spectacularly. Imran Khan hasn’t emerged from nowhere. People know him for the last 35 years. He has made a name for himself by his philanthropic endeavors whereas PML N is stained with corruption charges for the last 25 years. huh? I thought they are accused of being serial killers…No? Ch. Nisar you r living in fools paradise. This Nisar guy is Jaali from his head to his toe…….He is teh same guy who got his american passports stamped in London just because he wanted to hide his famiy’s dual nationalities. This fake man has nothing to defend his bosses but only has absurd allegations…….THIS IS BECAUSE OF THESE FAKE PEOPLE THAT PTI IS GETTING POPULAR DAY BY DAY!!!! Does this Nisar guy wear a WIG?! LMAO !!! Musharraf league’s trash –> spot on. And that “Nawaz Sharif’s” law is standard in many developing country’s to help attract foreign investment. During NS’s first term, Foreign Direct Investment tripled in two years. So “Nawaz Sharif’s” law worked. On Kashif Abbasi interview on 15th november, ch nisar said people have a right to know about where Hasan sharif got the money to start his business in london, and that he will get back to kashif abbasi in the shortest time possible. Its on record, you can youtube it. Still waiting for an answer from ch.nisar……. AND WHAT ABOUT iMRAN? Is Jamima Pakistani? Why do you people forget public donation? Sharifs running two big medical hospitals Ittefaq and Sharif medical city with their own resources. They never asked for donation. SKMTH is very very good project but please give a little bit credit to those who contributes. Imran share is peanut but gets 100% credit. Do not use philanthropic work for dirty politics. The mother of those children is a white British woman. She is not a Pakistani. I ask where was FBR?.was FBR sleeping? Once again it gets proved that FBR is dysfunctional organisation. Come to think of it, politicians are politicians.. a bunch of lying, deceitful characters. But why did no journalist at the press conference take Ch.Nisar to task for talking about Imran Khan’s assets rather than his own ? Mr. Critic is bombastic as usual. He is the only dynamo in Muslim league of which even Sharif brethren must be worried and afraid that he is pushing them into the background by his high pitched criticism of all others. Unfortunately he never looks back to his mentors. Mr Sharif is an international investor and has paid only Rs. 5000 tax. Vow. Mr. Chowdhry the right answer would have been to declare your assets and taxes immediately in response to Mr Khan’s declaration. AHAHAH Mr. Nisar should know that as per Pakistan law, anybody who earn money outside Pakistan and bring it back to Pakistan are excluded from tax from 7 to 10 years (Specially when one invest that money in Pakistan i.e. home, land etc). Shame on you Mr. Nisar, your whole family is US nationals and they hate being Pakistani and you are here talking trash about Imran Khan. At least Inram Khan is the first leader how came infront of public to show his assets. Doob marny ka mukaam hai Sharif brother and Nisar sahib ap k liye even PPP should come and show their assets now. Let’s see who is lion and who is wolf (PML-N). “around Rs145,000/kanal,” however he did not mention the total cost of the 300 kanal land he owns…..Can’t you do simple maths? That’s funny: one say exactly the same for Imran. Imran’s kids are British citizens while he sits in Pakistan and plays “dirty” politics. his kids live in Britain. unlike Chaudhry Nisar IK has never concealed that fact. nothing wrong with that. so dont lie Realist. Im a PTI supporter but for god sakes IK speaks the truth so dont lie in order to defend him. The time will prove whether PTI is a family party or not…. So far, we have been seeing Imran Khan as the only Chairman of this party for the last 15 years. Is this democracy really??? PTI is and has always been a one-man show, just like PAT (Pakistan Awami Tehreek) another establishment-backed party soleley led by Tahir-ul-Qadri. Imran Khan’s children are minors and therefore they are away from politics. But who knows when Suleiman Essa (from Jemima) grows up in UK or Tyrean (from Sita) grows up in USA they are attracted by the “love” of their fatherland! Don’t forget he has named the public-funded charity hospital after his mother Shaukat Khannum and we see Imran Khan’s portrait on the advertisements of Namal College!!! Why do we often see Jemima Goldsmith (Imran’s former wife) in PTI dharnas and rallies?? Are the Pakistanis so innocent to be fooled by conspiracies?? If Nisar sits on the throne in his house and delivers a verdict on Imran Khan then he is deceiving himself. Its the onlookers view through the camera that catches the opulence enjoyed by this politician. He even cheats himself by sitting on that high chair and lectures on Imran Khan. These politicians are at sea to defend themselves. All they can now do is to throw lies at Imran Khan and waste time of the nation. The simplest thing to answer Imran Khan would be to declare his assets. If Nisar Khan has not paid his taxes honestly then the nation should throw him out of his home and convert it into a educational center or girl’s hostel. Whatever makes you guys Happy, stop justifying everything regarding IK , like MQMers do. the POINT is Where ever the kids live has NOTHING to do with anyone’s Politics. Jemima proves Chaudhry Nisar’s point right. No, I didn’t give him a London flat either. He owned a flat in London when we met, which he bought with his cricket earnings. @saleh amjad yaar read before u comment what she is saying is proof that imran is honest guy. There Was A Slip Of Tongue But That Does Not Mean He Has Anything To Hide.